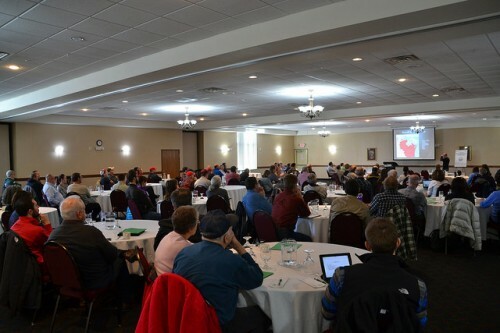 Since the first Watershed-Wide conference in March of 2011, Yahara Pride Farms continues to host these informative conferences annually each spring. The purpose of these gatherings are to provide watershed stakeholders with the opportunity to learn about new technologies, hear the latest news from industry experts, as well as receive an update on Yahara Pride Farms’ current progress and programs. Past conference speakers include Chip Bowling from the Chesapeake Bay area in Maryland who discussed the main sources of Chesapeake Bay pollution, bay restoration efforts, a timeline of agricultural events that occurred in his area and how Maryland stayed ahead of the game through a voluntary nutrient management plan in 1993. Another presenter was entrepreneur Phil Reed of VTI, who introduced his company’s Vertical Manure Injector toolbar- a tool used to inject liquid manure into the soil. Phil’s technology intrigued producers because of its great environmental and economic advantages and is now available to area farmers through the Yahara Pride Farms Cost-share Program. If you missed the conference, review the schedule and speakers below! On Thursday, March 3, YPF hosted its 4th Annual Watershed-wide Conference with the theme “Soil Health and Innovation in Our Watershed.” Area farmers and stakeholders gathered at the Comfort Inn and Suites in DeForest to learn about innovations in soil health and conservation from various speakers. Heidi Johnson, Dane County UW-Extension, started off the conference with why and how cover crops are beneficial to farmers. Heidi discussed how to select cover crops, as well as the best timing for cover crop incorporation and use. Wheat provides the easiest opportunity to integrate cover crops after manure application with legumes (i.e. radishes) combined with a grass (i.e. oats and/or barley). 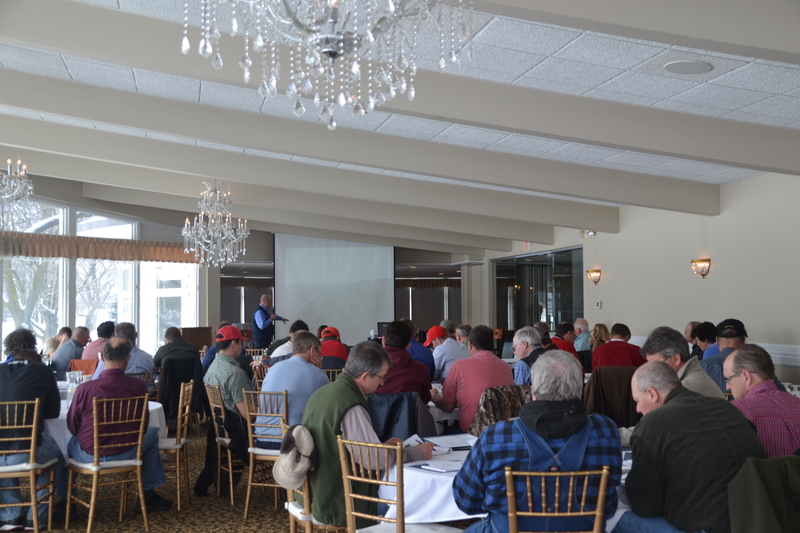 Economic benefits of cover crop incorporation in the short-term and long-term and seed costs were also discussed. Environment; Midwest Climate Hub, presented on the tools for improved watershed management including watershed scale problems and tools. As an example throughout his presentation, Dr. Hatfield referenced the Raccoon River Basin in Des Moines, Iowa, where nitrate levels in the Raccoon River have increased over time. Des Moines runs a reverse osmosis system to remove nitrates from drinking water. In this area, fertilizer application hasn’t increased much over time, and livestock numbers have actually decreased. However, cropping practices have changed from small grains and alfalfa to 87% soybeans and corn in the watershed’s agricultural land. “You can change nitrogen management all you want in the watershed, but you won’t see any changes until you change water management,” Dr. Hatfield said. He also discussed the Agricultural Conservation Planning Framework (ACPF), a risk assessment for fields in the riparian zone. This framework provides a targeting approach for optimum benefit. Hatfield discussed practices for managing drain tile and water quality, including two-stage drainage ditches, nutrient interception wetlands, controlled drainage, and wood chip bioreactors. Dave Taylor of Madison Metropolitan Sewerage District, discussed the Yahara WINs Adaptive Management Project. He credited the many partners, including cities, villages, towns and others involved in the effort and how YPF is working with Yahara WINs. Dave shared information on the Six Mile Creek Watershed pilot, which included the contribution of money to YPF for phosphorus reduction practices and for the support of YPF’s certification program. Dave provided rural and urban examples of the WINs practice implementation, including strip tillage, harvestable buffers, cover crops, and low disturbance manure injection in the rural landscape. Yahara WINs plans to expand the focus to the entire watershed with official startup in 2017, resulting in more funding to support phosphorus reduction practices and related efforts. Dennis Frame, Yahara Pride Farms conservation resource manager, stressed how not all practices are the best fit for every farming operation, but he wants to meet with individual farmers to see what works for their farms. Dennis concluded his talk by discussing data security, privacy and use, detailing how data will be stored in a cloud-based system and farmers will own their data. Andy Skwor, of MSA Professional Services outlined the 2015 NCR SARE grant project performed on three farms in the Yahara watershed for manure composting. He explained how the grant was acquired and what equipment was used. Andy emphasized how the volume of solid manure changed over time through the composting process and discussed the raw temperature data taken from compost piles at three sites. At a temperature of 131 degrees pathogens and weed seeds are destroyed. An analysis showed that a large percentage of nitrogen content was in the organic form and not available for immediate uptake. The primary use of the compost is for field application, with heifer bedding as a secondary use. Other benefits of composting include increased soil biology, structure, water retention, organic percentage, and weed production control. 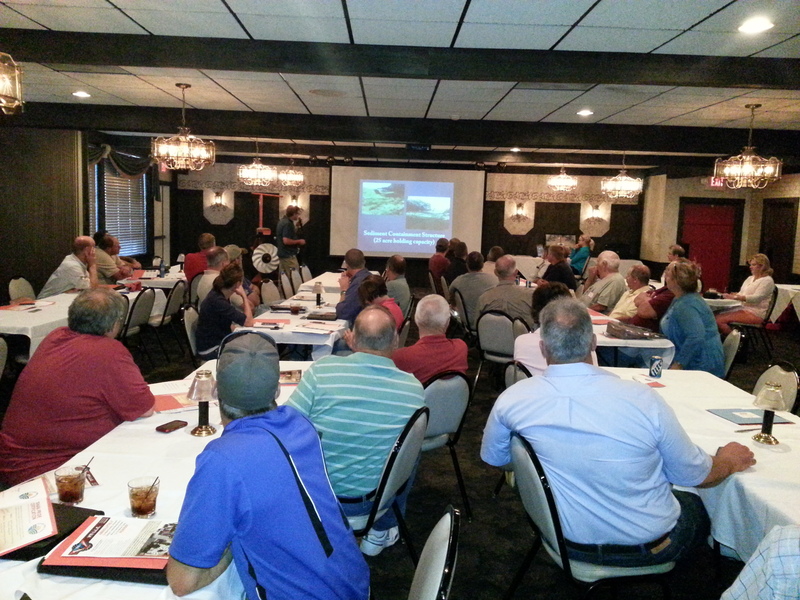 Dr. Hatfield closed the conference with another presentation discussing residue, soil health, and cover crops. He emphasized how farmers shouldn’t tolerate soil loss. Dr. Hatfield detailed the “Soil Degradation Spiral”, which is a combination of steps that cause a soil to lose good characteristics like water holding capacity, aggregation, and biology. The “Soil Aggradation Climb”, represents the necessary steps to acquire soil with good characteristics that are lost in the soil degradation spiral. Dr. Hatfield emphasized how biological activity rebuilds soil – not physical or chemical manipulation. Crop residue (“passive” barrier) and cover crops (“active barriers”) can benefit soil biology and reduce erosion. Moderating climate can protect soil biology through carbon, water, and nitrogen cycles. Thank you to our great speakers, dedicated farmers, and generous sponsors for helping make the 4th Annual Watershed-wide Conference a valuable event for all attendees. Our 3rd Annual Watershed-wide Conference, “Nutrient Management & Precision Ag”, was a huge success with a full room of over 100 attendees. Read below for highlights from each speaker’s presentation. Todd Stuntebeck, physical scientist at the U.S. Geological Survey, shared take-home points from 2014 based on water quality monitoring data. One interesting point is that USGS found that more than half of the total phosphorus entering the Yahara Watershed in 2014 was delivered in 12 days during early-spring snowmelt. Todd recommended using the Runoff Risk Advisory Forecast (www.manureadvisorysystem.wi.gov/app/runoffrisk), which can help farmers plan ahead to avoid spreading during times like these when risk is high. The tool shows the 10-day risk of runoff occurring based on precipitation, soil moisture, and individual basin characteristics. YPF’s Conservation Resource Manager, Dennis Frame, shared the achievements of our 2014 cost-share and certification programs. See page 3 for our 2014 program results. Dennis emphasized how important it is for farmers to speak up in the discussion on water quality. We, as the ag community and as part of a successful farmer-led organization, have ideas to share and can be a positive voice for agriculture. Dave Taylor, Director of Ecosystem Services at the Madison Metropolitan Sewerage District (MMSD) and Director of Special Projects for Yahara WINs, who also serves on the YPF Conservation Board, shared what will be coming next for Yahara WINs as the pilot project wraps up. Yahara WINs is a collaborative approach to reducing phosphorus runoff and a major funding source for cost-share practices, led by MMSD. During the 2016 transition year, Yahara WINs will continue to fund conservation practices as usual. By 2017, it is expected that the full-scale adaptive management project will be in place throughout the watershed, with expanded funding. Cost-share Program Kevin Connors, Director of the Dane County Land and Water Resources Department, announced a new harvestable buffer cost-share program that will be available to area farmers in 2015. Croplands located in the Yahara and Badfish Creek Watershed that are adjacent to perennial or intermittent streams are eligible. Buffers can be 30 to 120 feet wide, and can qualify for a $400-450 per acre payment each year depending on the contract length. Contact the Dane County Land Conservation Division for more information at (608) 224-3730. Heidi Johnson, Crop and Soils Agent at UW-Madison, provided a report on the economic findings of the 2013-2014 YPF Cover Crop Test Plot. When analyzing the data, Heidi focused on identifying cover crops that paid for themselves both in the short and long run. For more in-depth information on the results of the Cover Crop Test Plot research, please see this month’s Forward Farmer cover article. Wrapping up the conference was Wendall Boehlje, Agriculture Technology Specialist at WinField, a division of Land O’ Lakes. 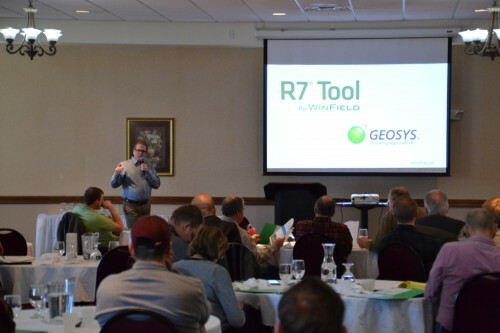 Wendall presented information on a satellite imagery tool called the R7 that helps farmers detect field data. Through this technology, farmers are able increase their efficiency by using zone maps generated by field data to place crop hybrids where they will perform best. Thank you for helping make the 3rd Annual Watershed-wide Conference a valuable learning opportunity. We especially want to thank our speakers, the farmers who attended, and our generous sponsors: Badgerland Financial, Dairy Business Association, Dairy Business Milk Marketing Cooperative, Wisconsin Soybean Marketing Board, Digested Organics, Carl F. Statz & Sons, Wagner Insurance, Willy Street Co-op, and Yahara WINs. 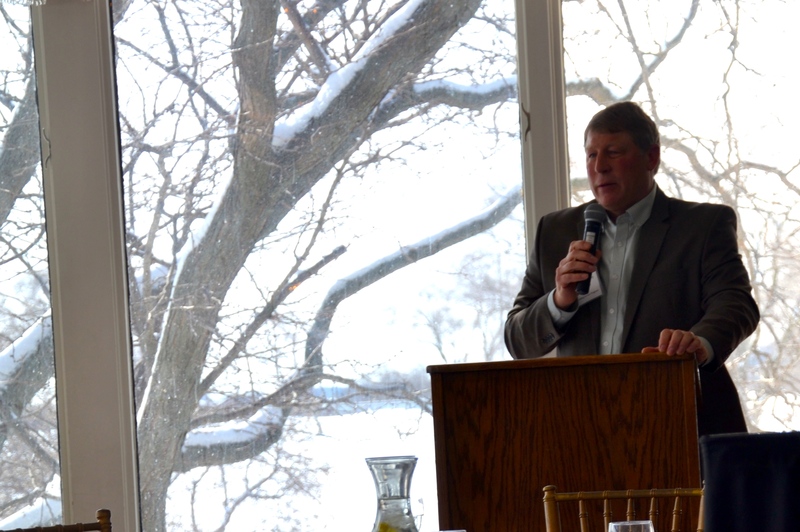 On Wednesday, March 5th, area producers, agribusinesses, government workers, and other pertinent watershed stakeholders gathered at the Lake Windsor Golf Club for this spring’s Yahara Pride Farms (YPF) Watershed-Wide Conference, “Building on our Progress”. The conference enforced our concept and purpose, updated attendees on our progress, educated participants on the benefits of cover crops and other conservation practices, and shared details on the YPF certification program. 1. Help inform agriculture of new water quality, rules, laws and issues. 2. Create a mechanism to show farmer environmental sustainability while rewarding farmers for good stewardship along with a way to track collective progress to show watershed advancement. 3. Assist in advancing new ideas and technology that yields better water quality along with farm profitability. 4. Make improvements in the watershed by earning the trust and respect of farmers, private citizens and government workers through outreach about our projects and programs showing agriculture is committed to doing its fair share. 5. 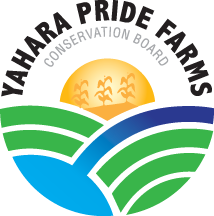 Establish the Yahara Pride brand name that both farmers and citizens can relate to. These objectives have helped Yahara Pride Farms gain its momentum in the watershed and will continue to be our focus as we work towards improved soil and water quality. Our first presenter, Dave Robison from Legacy Seeds, Inc., outlined the variety of cover crops used in Wisconsin. Dave highlighted soil and economic benefits of utilizing cover crops and provided various suggestions on how to use them in your operation. UW Extension’s Crop & Soil Educator Heidi Johnson continued the topic on cover crops with an update on the Yahara Pride Farms Cover Crop Test Plot. The update featured the analysis on the test plot, which reviewed the data that was collected on specific cover crop species, planted on various dates. Heidi explained that as more data is collected, the information will be used in identifying the economic benefits of cover crops to farmers. During lunch, Wisconsin State Representative Keith Ripp outlined the Implementation of Husbandry Bill. The State Representative was able to respond to some of the concerns the audience proposed. One common concern regarded how the bill would be enforced. It was made clear that the law is being written with local flexibility so that each town will have ability to manage their own constituent needs. We were honored to have the Department of Agriculture, Trade and Consumer Protection Secretary, Ben Brancel in attendance, who thanked Yahara Pride Farms for their positive, farmer-led approach. He praised the Wisconsin farmers’ values by stating, whenever farmers are faced with a problem, they will find a solution to meet the challenge. He noted that Yahara Pride is being looked at by many throughout the state as a model for solving water quality issues in other watersheds. Dennis Frame, one of Yahara Pride Farms Conservation Resource Managers, presented information about our quickly growing Certification Program, which helps farmers identify and correct areas or practices, that could have a negative impact on the environment. Following Dennis, Chairman Jeff Endres shared information on what Yahara Pride Farms will be offering in our 2014 cost-share program. To wrap up the conference, a panel comprised of a variety of watershed stakeholders discussed how their organization sees their role in water quality improvement. The discussion emphasized that to achieve improved water quality everyone – producers, government and community members – must all be involved in the solution.